The other night my friends and i had a bonfire at the Ventura Harbor Beach. We have done this millions of times throughout the years, but the most memorable one was from last October when we were visited by the beach's local hobo Bongwater (Bongwater is the one standing in the photo). 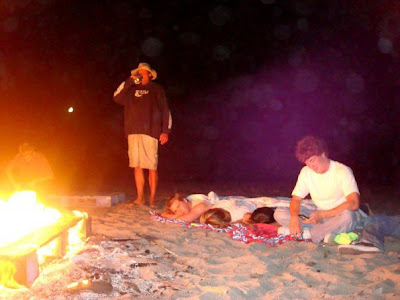 Bongwater is a self-proclaimed storyteller of the beach, and we were lucky enough to run into him again at our last bonfire. He told us new stories from the last time we had encountered each other, and he is a wonderful storyteller. He told us how he once was in love with his girlfriend who was a mermaid. He met her while fishing at the beach. She walked up to him asking what he was fishing form, and he jokingly said "A mermaid", she then told him that he had caught one, little did he know she wasn't kidding. She was able to be human for 28 days at a time before she would have to go back into mermaid form. They owned a tanning salon and bikini company in Santa Barbara and were living very happily with one another until she told him she was going to swim to Hawaii. Bongwater tried to think of every possible way to go there with her, but he couldn't wrap his head around the fact that she was a mermaid and could swim there and he wasn't, which made their romance end. Another fun story he told was when he outran the cops when he was in high school. He and his friend had gone to a concert where they had been drinking and decided to race afterwards when the cops noticed them. Bongwater didn't want to get caught so he drove off and hid his car in a ditch for the rest of the night so they wouldn't find him and for the next three months he hid his car in the garage just in case. One day while he was working in his dads shop the swat team tackled him to the ground shouting "We've got you now Bongwater!" and they took him off to jail. Once in jail he told them that he wasn't the one that ran from the cops, that his car was stolen three months ago so they decided to let him go free. The moral of that story was to not drink and drive. He has loads of stories, too many for me to type out but those are two of the best. Hopefully he'll stop by our next bonfire as well. One can only hope.